Sen. Rand Paul (R-Ky.) championed criminal justice reform and invoked Martin Luther King, Jr., while addressing a mixed audience at Maryland’s Bowie State University, a historically black college, on Friday. The Republican senator told the crowd of 200 students and community leaders that reforms to the justice system are necessary because current sentencing laws are harsh and disproportionally affect African-Americans, The Huffington Post reported. 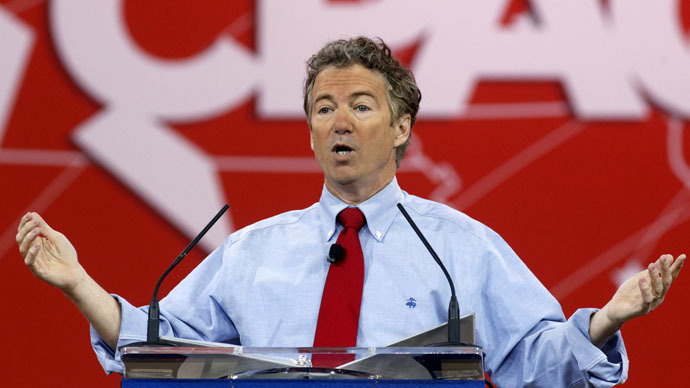 The speech was part of Paul’s minority outreach effort ahead of his likely bid for president in 2016. In his short address of 30 minutes, Paul spoke out against practices such as excessive fines that have become an economic boon to local governments, as well as the seizure of private assets by police prior to criminal conviction. Paul’s comments were especially timely with the release of the Department of Justice’s scathing report on abusive practices, like excessive fining, carried out by the Ferguson Police Department and the court system. The report, released last week, has led to the resignations of six officials so far – including a judge and police chief. Paul argued against mandatory sentencing guidelines for non-violent offenders, saying the punishment for drug offenses may deprive households of a potential wage-earner, and a conviction can affect an offender’s chance of finding a job. His proposed ‘Redeem Act’ legislation would allow for non-violent felons’ records to be expunged once they’ve completed prison time. Paul also touched on a warning about the National Security Agency’s surveillance programs, reminding an audience composed of about as many African-Americans as whites to "think about how Martin Luther King's phone was tapped." He also called for a smaller tax burden on businesses to spur economic growth, and giving parents more choice in deciding which schools their children can attend. Paul took three questions from the crowd, which were written on cards and selected by a moderator. He was asked about his position on oil and gas exports, to discuss his medical marijuana legalization bill, and to reflect on the gains made by African-Americans over the decades. Reaction to Paul's speech among Bowie State students was mixed. Rob Stubblefield, a grad student, endorsed some of Paul’s ideas on economics and reforms for the criminal justice system, but he was skeptical.